Who ever said looks don't count? Well, for this very visual person they do. That is the entire merit on which this smoothie was chosen. Isn't it gorgeous? Two awesome layers of smoothie goodness. 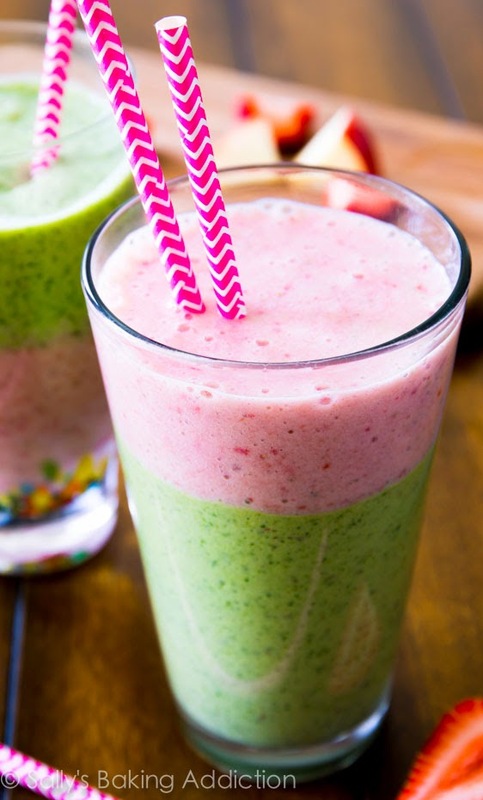 I found this smoothie on Pinterest via simple smoothie search. When Sally's Baking Addiction came up I was sure it was going to loaded with all sorts of things I didn't want. I am very familiar with Sally's site because she has some of the best cookie recipes and techniques on the web but smoothies? Perfect example of jumping to the wrong conclusion. I was wrong. The smoothie not only looked purddy, but it tasted good and was good for you. I loved it. Don't be like me and think you can add ice to the recipe instead of freezing the fruit. It only adds more liquid to the recipe and you need the thickness to successfully achieve the layers. The frozen fruit gives it the thickness. Robin thought it was ice cream so I guess it it kiddy approved! Definitely looks appetizing. I love frozen fruit, gotta look at the recipe especially since it's kid approved! I love a pretty smoothie. Mine are never this pretty but taste good. I'll check out this recipe and see if I can make it pretty. Ha! Who am I kidding? I just want the smoothie. That smoothie looks so good!